Written and directed by Michael Spierig and Peter Spierig, this Australian zombie horror-comedy plays more like a science fiction movie more than anything. Rene (Felicity Mason) goes into a farmhouse to escape the zombies that were chasing her after a meteor shower. In the farmhouse, she meets a few others (Mungo McKay, Rob Jenkins, Lisa Cunningham, Dirk Hunter, Emma Randall) and they must figure out what is happening in the town while trying not to get eaten by the zombies. I didn’t enjoy this movie at all due to a number of things. The characters kept asking, “What were THOSE things? Why are they trying to eat us? Are they dead?” as if they’ve never seen a zombie movie before. Moreover, the characters are very one-dimensional. It would have been so much better if the cops were the cowards and the regular folks would have been the leaders. Taking some of those obvious elements and putting them upside down would have given the illusion that the directors were trying to make a better movie. For a horror picture, this is very light on the scary factor. The zombies are slow enough but did the characters have to be slow as well (mentally and physically)? None of them had actual survival skills and I wouldn’t buy for a second that they would survive if there were real zombies running around. If I see a zombie trying to get to me to eat my brains, I would run so fast, I wouldn’t even think about silly things like leaving something behind. The stupid characters were good at three things: screaming, yelling at each other, and asking redundant questions. Lastly, I’m very frustrated with the fact that there were actual aliens in this movie. It was so random and everything was spelled out for us in the end: why there were zombies and why the aliens decided to visit our planet. What made other zombie flicks so successful (1968’s “Night of the Living Dead” and “28 Days Later”) was the fact that there were questions left unanswered. Even if they were answered, those films left a possibility that the truth lies beyond the given explanation. 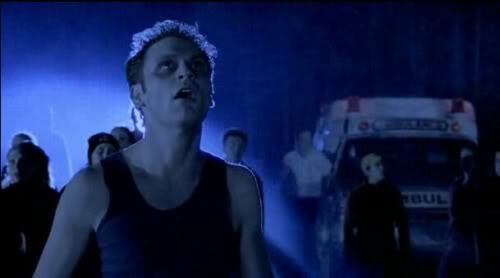 Overall, “Undead” was a random mess of a movie. It is far from creative and it didn’t have enough enthusiasm to keep my attention. I thought “Zombieland” was far scarier and that was a comedy. That should give you an idea with how lackluster this movie truly is.